As with all golf equipment, there is a wide choice when it comes to deciding on a putter. Professionals will espouse the virtues of a particular make, while amateurs will tell you why they wouldn't use any other than the one in their bag. However, it's what suits the individual that is important. Your playing partner may hole putt after putt with irritating regularity but you might find his club impossible to use. Some players swear by the more traditional blade variety, others the peripheral weighted head. Then there is the chunkiest of the three basic types, the aptly named mallet.In terms of length, again we are looking at three categories: conventional, belly, and long putter. The conventional has the shortest shaft of the three, between 33 to 36 inches, which means the player leans forward in the stance in order to see the line between the ball and the hole. The relative short length of the shaft also means that you gain a greater "feel" of the contact between the ball and the club face. The belly is of 41 to 46 inches and is designed so that the end of the shaft rests against the midriff of the player, providing extra stability. The long putter, between 48 and 52 inches, is sometimes referred to as a broomhandle. The player adopts an upright stance and the stroke is reminiscent of a sweeping movement, hence the name. In terms of the face of the putter, players can now choose from metal, insert and groove. Again, metal is the more traditional, manufactured from, among other materials, steel, aluminium or titanium; the insert features a non-metal piece with the club face resulting in the weight distribution of the head being shared between the heel and toe. Some models feature grooves which help the forward roll of the ball. The grip is another consideration: the thinner variety offers more "feel", thicker ones reduce the possible influence of the hands and wrists. And price? Well, again, as with all types of equipment you can pay anything from £20 upwards depending on what your wallet will allow and what takes your fancy. Don't forget the second-hand option if you want to limit what you spend. Too much information, you may be thinking. And, yes, you can be faced with a bewildering choice. But the key is finding the putter with the characteristics that suit both your technique and physique, and this is very much a question of trial and error. And even when you find one that you feel comfortable with, it may be that as your game progresses you decide to switch. On the other hand, faults in your putting may develop over time which necessitates a rethink. 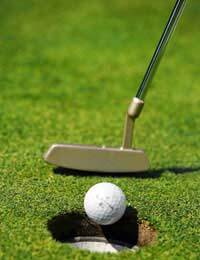 But whichever putter you decide to settle down with, remember that it is your only friend on the green when a few inches can mean the difference between a birdie and bogey. So be sure you can count on it.